The custom logoed Bandage Mate - 5 strips is perfect for any company involved in the healthcare industry. It is a useful product that includes 5 latex-free, fabric bandages. Featuring your companies name and logo, it is sure to be useful to potential clients and customers as well as promote your companies name. Coming in a wide range of colors and constructed of soft vinyl, it is a great choice for your next business event. Customer Review: Excellent way to give people your business info, and the band aids are something everyone uses. One problem I found I've had now and in past orders was that some of the bandage mates were empty and sometimes there are printing errors where the text was halfway on and hallways off the bandage mate. Customer Review: Distribution to public. Customer Review: Great promotional product. Everyone wants them for their purse or even a mens wallet. Will order again. Product Usage: Promotional and incentives. Customer Review: Product is very popular with our clientele, and is something people can use. The quality is very good. 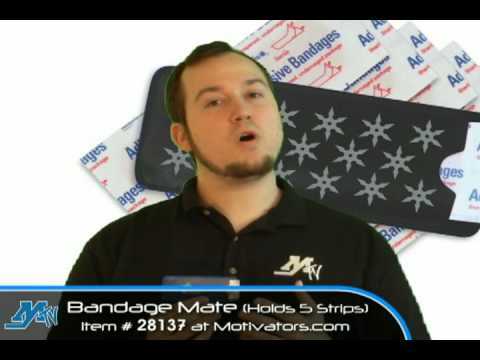 Question: I ordered 500 of the Bandage Mate 5 strip Item #28137...is there a discount for reordering another 500 since you already have the artwork on file? Yes, if this is an exact repeat (same item and art - no changes) there there is a $20.00 re set up fee instead of the $47.50 set up fee. Please feel free to contact me and I will gladly assist you with this re order.Thank you.